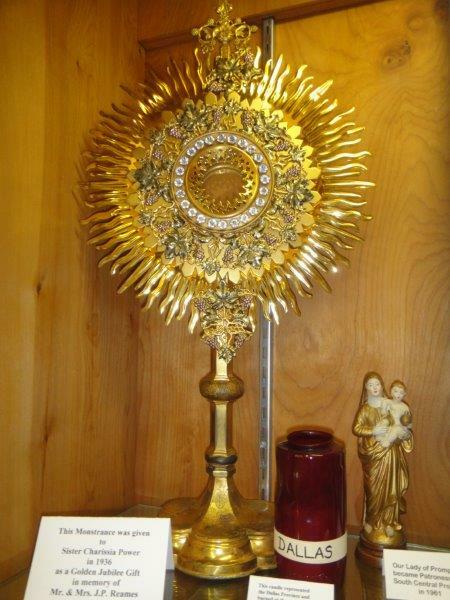 This monstrance was given to Sister Charissia Powers in 1936 as a Golden Jubilee gift in memory of Mr. & Mrs. J.P. Reames. The main Heritage Room in Chatawa, Mississippi was opened in the late 1990s in order to showcase many of the artifacts given to Mother Georgianne Segner as she traveled the world as General Superior of the School Sisters of Notre Dame (1968-1977). The display cases also have treasures from the late 1800s when Mother Caroline Friess opened missions in New Orleans, Louisiana, and Chatawa. There is also a collection of Madonnas given by Sister Petrine Kersting who was on the first council of the former Dallas Province.